It’s been a very busy several months for a variety of reasons, and I have lots of great updates to share. But all in good time…. In the meantime, I am posting my schedule for CAN-CON, Ottawa’s own science fiction and speculative fiction convention. If you haven’t been, I strongly suggest you go – we have an excellent program lined up and there is sure to be something for everyone. 7:00 PM: “Be It Resolved: Stop Writing Novels – Write Short Fiction” – The Live Debate! As a way of celebrating the upcoming re-launch of its website, Solstice Publishing has reduced the price of its e-books on all Amazon sites to only 99 cents! If you’re thinking about picking up a few extra titles, exploring a new genre, or if you’re interested in trying out a new author or two, you can’t go wrong. Retrospective stories can touch people on an emotional level, because they provide a level of intimacy that a conventional narrative can’t. It’s as though the narrator is taking the reader aside, perhaps to a place with a cozy fireplace and (if the story is geared towards adults) a nice side table where a few drinks await, to let them in on a secret that no one else knows. If that secret involves adventure, all the better. The challenge when writing a story in this way is that we know the narrator overcame (or at least survived) whatever challenges they faced; the only mystery is what happened to them on their journey – and that journey had better be interesting. 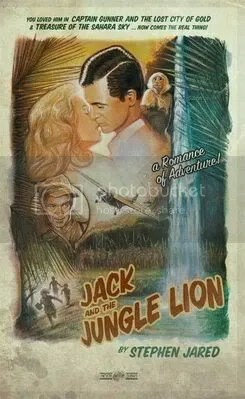 Jack and the Jungle Lion is a retrospective story set during the pre-war golden age of Hollywood, focusing on how Jack Hunter, a dashing movie star reminiscent of Errol Flynn, met the woman who would become his partner. Although on-screen Jack is the sort of man every woman wants to be with, in his personal life he’s a complete cad, unhappily married to Theda Lomond, a former star from the Silent Film era who refuses to admit that her career is on the downward spiral. They live in separate worlds, seemingly married in name only. Jack’s life changes forever when he is cast as the leading man in a new production to be filmed in South America. On the way, he meets Maxine (“Max”) Daniels, who will be working with him as an animal trainer, and her two children. Jack makes a less than stellar first impression with the practical, no-nonsense woman, but her strong spirit intrigues him in a way that no other woman has. Before he can act on these impressions, disaster strikes in the form of a plane crash. At this point, the story’s tempo switches to something more in line with Jack’s adventure movies, as Jack, Max, her two children, and Clancy (the co-pilot of the plane) must band together to face the dangers of the Ecuadorian jungle. Jack learns just how strong, but vulnerable, Max really is, while he demonstrates to her that he can, in fact, do more than act the part of the hero. Jack and the Jungle Lion is written in the often-melodramatic style of films from the 1930s and 40s, with obstacles that sometimes seem to come out of nowhere and present the heroes with life-or-death situations, and which are sometimes resolved by luck. “Only in Hollywood,” you might say, but given that one of the main characters is a star from that era, this style works for the story. On the whole, I felt as though I was watching one of those old Flash Gordon or Ray “Crash” Corrigan serial dramas that keep you tuning in to find out what happens next. Jack’s story also faithfully captures the feel of the Golden Age of Cinema, a time when the fantasy-land aspect of Hollywood had an especially strong pull on the American psyche, which was still reeling from the hardships of the Great Depression and unknowingly standing on the brink of the Second World War. This was a time when dreams were literally being made, and some of the glitz of old Hollywood is captured by the descriptions of the people and places in Jack’s world. Likewise, the descriptions of the jungle, and the natives who inhabit it, are equally evocative. I could picture what Jack and his companions were seeing and doing very easily; although the immersive quality of the story would have been even more powerful if there had been equally strong detail for the other senses. Overall, Jack and the Jungle Lion is an entertaining read that has a “feel good” ending, but you have a few jumps and bumps along the way in true Hollywood style. If you want a story of classic romantic adventure, I suggest you give this one a look – and check out Stephen Jared’s other works, too. …or follow him on Twitter! Presenting “Hooked”, by Jim Baugh! HOOKED is based on the true-life story of Virginia outdoor television producer Jim Baugh. Jim Baugh Outdoors TV is one of Americas most diverse and entertaining outdoor programs and has been in syndication since 1989. HOOKED is a hilarious behind-the-scenes story of filming a southern outdoor TV show. From the Chesapeake Bay to Key West, these on-location excursions will make your sides hurt with laughter. You’ll meet a cast of seafaring characters full of colour and humor – from the docks in Gloucester, Virginia to the Atlantic Ocean, and a boat load of jolly swashbuckling Pirates. The stories and characters in HOOKED are timeless and span a period of over forty years. HOOKED also explores the solemn drama of dealing with divorce, death, and mental illness. The novel also delves into the totally crazy and insane world of mid-life on-line computer dating. This is a hilarious look at dating in the computer world after 25 years of solid marriage. These “Dating” stories are contemporary, racy, scary, cheerful, timeless, and based on true events. Anyone who is old enough to date will soon relate to HOOKED as the comical reference for dating in the new millennium. This adult romantic comedy story also relates to the power and testament of faith. 50 Years of an exciting, action packed, and extremely charismatic colourful life and career, packed into 28 chapters. It is a fast ride for sure! Jim Baugh has been producing National and Regional television shows for 25 years. Programs include: Jim Baugh Outdoors TV (220 episodes), Ski East, Classic Fishing. Fishing Virginia and, RV Times. Jim has written over 300 columns for numerous magazines during the last 20 years including: Motor boating Magazine, Fishing Smart, The Chesapeake Angler, The Sportsman Magazine and Travel Virginia Magazine. Stop by the bar to hang out with Jim!!! Before anyone starts jumping down my throat, and accusing me of intellectual snobbery, let me clarify what I mean by being “well read”. To me, a person is well read if they have sampled as many literary genres as possible – action, sci-fi, fantasy, romance (and possibly its own sub-genres), erotica, the classics, western, mystery, horror, and so on. Bonus points would be awarded to those who go beyond dead trees to try other forms of “book”, including e-books, hypertext books, and even interactive fiction. “But,” you might ask, “Why read unfamiliar genres? I’m happy with my favourite authors.” A valid point, but here’s something to think about: What happens if you always eat the same foods, every day? Well, lots of things can happen. For example, your body might become intolerant towards one or more of your staple foods. Or if your regular diet is incomplete, you could be depriving yourself of essential nutrients to maintain optimum health, which could compromise your immune system over time. You might also, by not trying new foods, never experience new taste combinations that you might have loved. The same thing applies to reading, in my view. If you read the same sort of thing, day in, day out, your horizons will remain static. You will probably never experience the world through a different narrative voice. You might never be exposed to new storylines. Plus, you might even become bored with it, given enough time. However, if you try a new genre – even just once – your literary world will immediately broaden. Explore that story like an undiscovered country, and try to be as open as possible. You don’t have to like it, but at least you will be able to say you tried it.